Patty Jenkins has been working in Hollywood for a long time, but her stock is about to go up in a big way. She is the director behind the upcoming live-action Wonder Woman movie, which looks like it is getting a ton of very positive early buzz. Though, Marvel fans may know that she was actually supposed to direct Thor: The Dark World, but wound up departing the project before filming, paving the way for Alan Taylor to step in. Now, we finally have some details about what Patty Jenkins' vision for Thor 2 would have been. The director recently spoke with Buzzfeed as part of the promotional tour for Wonder Woman, which finally hits theaters on June 2. During the conversation, Patty Jenkins was asked about Thor 2 and what she would have done with the movie, had she wound up making it the way she wanted to make it. Here's what she had to say about it. "I pitched them that I wanted to do Romeo and Juliet. I wanted Jane to be stuck on Earth and Thor to be stuck where he is. And Thor to be forbidden to come and save Jane because Earth doesn't matter. And then by coming to save her... they end up discovering that Malekith is hiding the dark energy inside of Earth because he knows that Odin doesn't care about Earth, and so he's using Odin's disinterest in Earth to trick him. And so it was like, I wanted it to be a grand [movie] based on Romeo and Juliet... a war between the gods and the earthlings, and Thor saves the day and ends up saving Earth." The bones of what ultimately became Thor: The Dark World are still in that pitch, but this sounds like a much more focused and quite different approach. 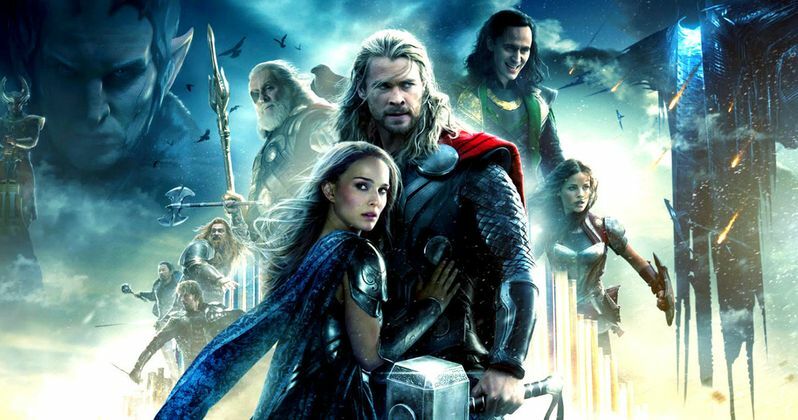 As it stands, Thor: The Dark World is widely regarded as one of the weakest entries in the Marvel Cinematic Universe to date. It is impossible to say that Patty Jenkins' Romeo and Juliet version of Thor 2 would have ultimately turned out better, but it at the very least sounds like something a bit unique within the framework of the MCU. Things probably worked out better for Jenkins, though, all things considered. At best, if she had done Thor 2, she would have made a good movie in the MCU, an already thriving enterprise. With Wonder Woman, if early buzz is to be believed, she has made the best movie in the DC Extended Universe to date and will have crafted a quality comic book movie centered around a female superhero for the first time in the modern era. That is no small feat and one that should earn her some more notoriety when all is said and done. Still, Marvel fans, especially Thor fans, will probably always wonder what could have been after hearing this pitch. Maybe we'll finally get that great Thor movie when Thor: Ragnarok hits theaters in November? What Happened to Sif Between Thor: The Dark World and Ragnarok?